We leave Mount Wood and travel via the Loop Road to the Silver City Highway. 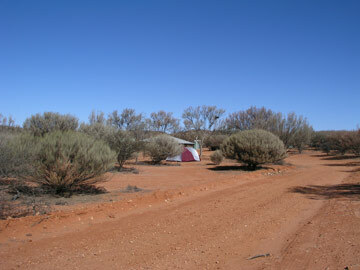 This takes you past Horton Park Outstation, a smaller homestead used by workers while remote on the Mount Wood Station. One of the buildings is in good condition but an even older building nearby is just a frame. These are both quite interesting. From here we head north to the Jump Up Loop Road. 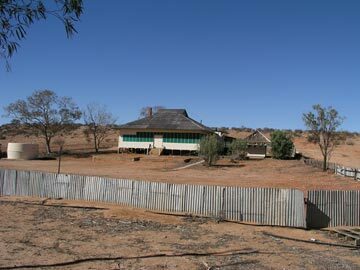 This goes to Olive Downs, the site of the pre-national park homestead for the Olive Downs Station (built in late 1800s). 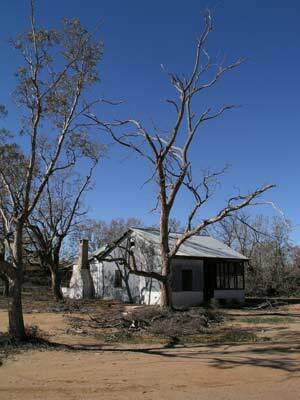 The shearers quarters are now a ruins, devastated by a mini-cyclone some time ago and the homestead is no longer occupied (at least in 2003). Back in 1980 I spent two weeks here working on a kangaroo research project. This was in January and it was hot!!! It was also very interesting as we had to catch and release kangaroos each day and then track some of the ones fitted with radio collars. After this we go south towards Tibooburra via the Loop Road. We drop into the Jump Up Camping Area and then the Lookout. This gives fantastic views across the lowlands. Once you drop down there are even better views back at the Jump Ups. From here we travel to the Mount King Tank. This is located at the site of the Mount King Station (since demolished). All the home tanks (as they are called) are totally empty of a water. A national parks field officer tells us that a few months back he removed over 300 dead kangaroos from one tank when clearing it of silt. We drop in to look at Dead Horse Gully Camping Area where we plan to stay tonight and then we go to the national parks office to say hello and drop off posters I bought up for them from Sydney. 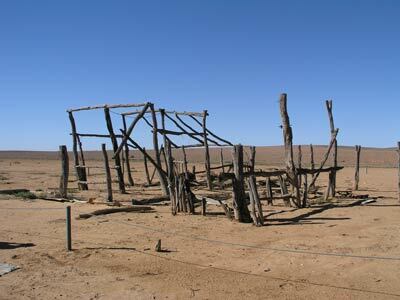 We also check up about the road to Innamincka after what we were told at Mount Wood. The printed report says it is closed but that was dated 10 July (four days ago). However, some women we saw at the lookout said that the sign at Cameron Corner the day before said all roads are open. 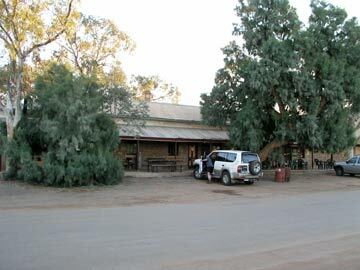 From Tibooburra we drive south to Milparinka where we have a beer in the pub and on to Depot Glen. 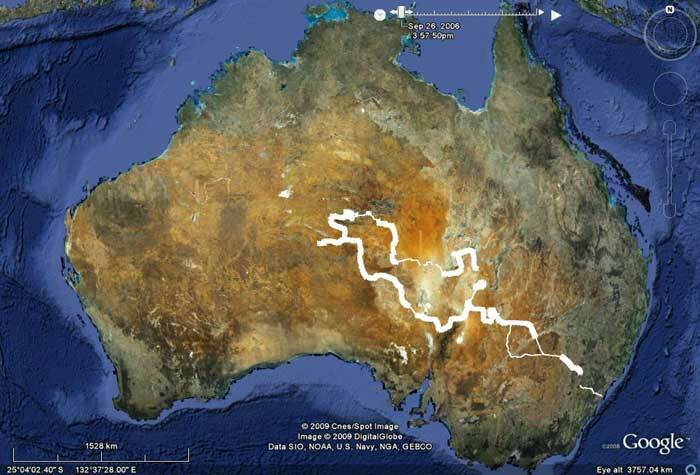 This is where Sturt was stuck on his exploratory trip to Central Australia from 27 January 1845 to 17 July 1845 due to the heat and lack of water elsewhere. There is a lot of water in Depot Glen but back in 1980 when I last visited it had only a pool a few metres wide and 30 or 40 metres long. The second in charge of this exploration party was James Poole. He died on 16 July 1845 and is buried a short distance from the main Depot Glen waterhole. We then went to Mount Sturt (which is also called Mount Poole) to see Pooles Cairn. This was erected when Sturt was stuck at Depot Glen for a couple of reasons, one to keep the men occupied and another to mark the hill. It was named after Poole after his death. It is quite a hard climb to top, good view but not sure if worth it. It was time to head back to Tibooburra and when we arrived we refilled the car with fuel in the anticipation of leaving Tibooburra tomorrow morning. We still have not heard from the others. We had arranged to meet them at Milparinka in the afternoon after their trip from Bourke. 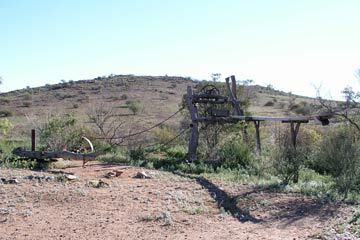 However, as the road was no longer open all the way to Milparinka, we expected that they had decided not to head south out of the way and would be in Tibooburra when we returned. Back in town we had a beer at the Family Hotel. There are many more paintings on the walls than when I was last here in 1981. After the beer we headed to Dead Horse Gully Camping Area and set up camp. The others are not here yet. This is a very nice camping area, much better than when I stayed here in 1978. We had a great meal of T-bones, sausages, pasta and drank some white wine. The others still had not turned up when we went to bed. I wonder what has happened. Somehow I lost my beanie yesterday so we go back to the national parks office to see if I left it there. No, looks like I will have a cold head at night. I phone Les to see where they were. His mobile phone rings so I know that they are not on their way. He tells me they are still in Bourke as his car had problems yesterday. He had been towed back from almost Wanaaring. It is probably the differential. He tells me to phone him later to see what the problem is and when it might be fixed. This late change of plans means we have to find other things to do. 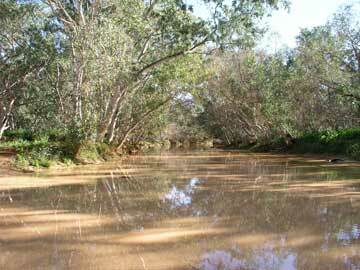 We drive north to Warri Gate which is the crossing from New South Wales into Queensland. We have morning tea here before moving onto Olive Downs and via Middle Road to the Binerah Downs Road. We stop and have lunch in a creek bed. 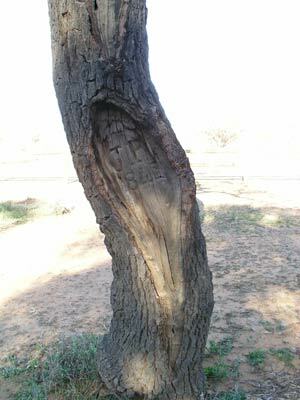 Then we return to Tibooburra and I phone Les again. He is still not sure of the problem but they will not be away before Thursday. I tell him that we will move to Innamincka tomorrow but will phone him again before we leave town. 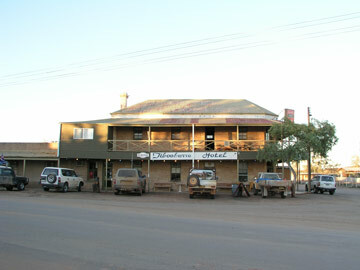 We decide we had better try out the other pub in town so we have two middies of Carlton Draught in the Hotel Tibooburra and I purchased a stubby holder, $8.25. 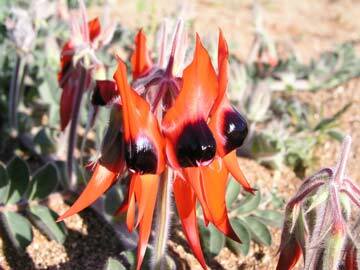 We then go back to the camp site and spend some time looking at the Golden Gully Mining Site which is a recreation of a mining area using (mostly) original materials and we do a walk around the camping area that has some Sturts desert peas. Look in dry creek beds if you want to find them. Our dinner is Indian curry chicken and rice. The daytime temperature got to 23C, quite windy at times (northerly) and heaps of flies.